xcceries has no other items for sale. We accept PayPal only via eBay Secure Check-Out. Payment is expected within 7 days of auction close. Unpaid Items will be forfeited per eBay policy. Immediate payment needs to be processed for items with Add to Cart option so that any promotional discounts can be applied to your order immediately. Shipped my purchase promptly, in excellent shape. Very quick. Very prompt shipment and exactly as described. Highly recommend to all!! 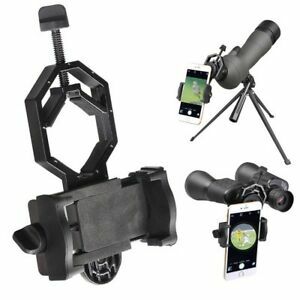 Great adapter for my cell phone camera will work on my telescope, spotting scope, rifle scope, and my binoculars. If I had a telescope it would probably work there also I just don't use that. It will also fit on my night vision monocular that I use at night good product good price. Nice idea but phone holder is off center and the thumbscrew to lock down the phone holder will not tighten enough to stop it from moving. Had to add a rubber washer to fix. Otherwise it's just okay. Great quality. Used it with my telescope for the eclipse. Awesome.